Commentary: There are two ways to handle a problem and each way is demonstrated. The Israelites complain about their problem. Moses takes the problem to the Lord, who is able to provide a solution. The manna provided by the Lord, as well as the water represent Jesus Christ, who is the Water and Bread of Life. We see the perils of not relying on the Lord when the Israelites face the Amalekites and when Moses’ father-in-law comes to visit. Jethro suggests changes to Moses, who does not consult the Lord in their implementation. On the surface, the ideas may seem sound, however, they can have disastrous consequences. In a few thousand years, the group appointed by Moses became the Sanhedrin, the very group which ensured that Jesus Christ was killed. Moses took the Israelites to Mount Sinai, where they agreed to live under the law of the Lord and Moses was given the 10 Commandments. 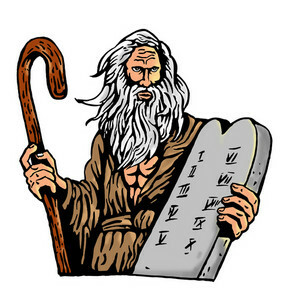 The 10 Commandments were not the end of the Law, but the beginning. Focus Verses: 18:15-27 What mistake did Moses make? How often to consult the Lord in your decisions? What happens when you do? What happens when you don’t?